Your days in Rio de Janeiro are spent exploring this spectacular city by bike. Routes range from flat pedals along the beach paths of Copacabana and Ipanema, and around the Rodrigo de Freitas Lagoon, to steep climbs up to the Tijuca Forest and statue of Christ the Redeemer, with wild downhills and single track action right in the middle of the city! Our Cycling Tours of Brazil are all basic ideas that can be tailor-made to match your requirements. Any tour can include one or more destinations, and can be purely dedicated to road biking or mountain biking, with some hiking trails included too to visit certain waterfalls. We can also arrange long-distance trips, or mix your cycling with other activities such as climbing, kayaking or tandem hang-gliding flights, some regular tourism, and some nightlife. We include all that you need during your trip, the accommodation with breakfast; all airport transfers and other road journeys; any activities and excursions with English-speaking guides and relevant entrance fees; plus some popular extras. 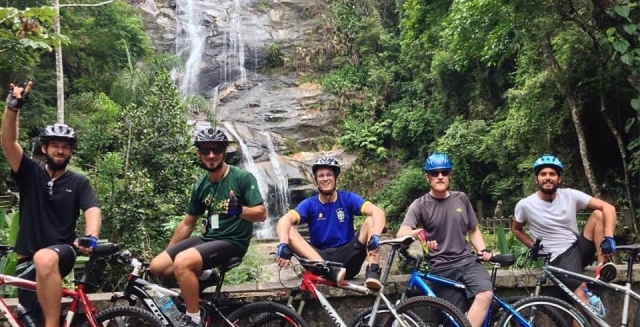 For our Cycling Tours of Brazil, you will need to bring your cycling clothes, although bikes and helmets will be included, plus tools and spares as necessary. All rides are undertaken with an experienced, qualified local guide, with activity insurance included. 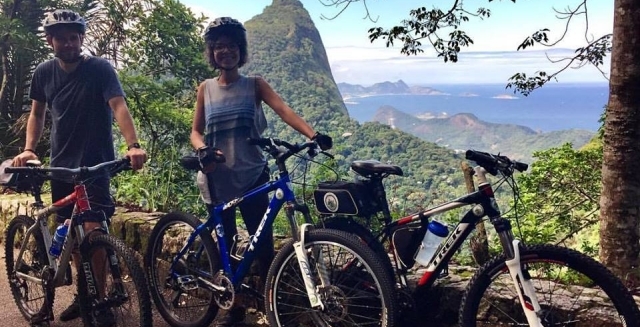 Cycling around Rio de Janeiro is a wonderful way to see the main sights and some hidden ones, and you can enjoy it all with Brazil Adventure Tours. Combines With: We can combine this trip or parts of it with journeys down the Costa Verde to Ilha Grande and Paraty, to Iguazu Falls, or for more mountain biking in the interior national parks such as Chapada Diamantina and Chapada dos Veadeiros. Day 1 : Riding Around Rio de Janeiro! Your Rio de Janeiro Mountain Bike Tour begins on arrival in the city, where you will be met by your Brazil Adventure Tours guide. After checking in to your hotel, you head out for your first ride around Rio! An easy pedal on the flat cycle paths takes you along Ipanema Beach, around the Rodrigo de Freitas Lagoon, and down the whole length of Copacabana Beach. You then pass through the tunnel to Botafogo and Urca, with Praia Vermelha being the base of the Sugar Loaf Mountain cable-car. 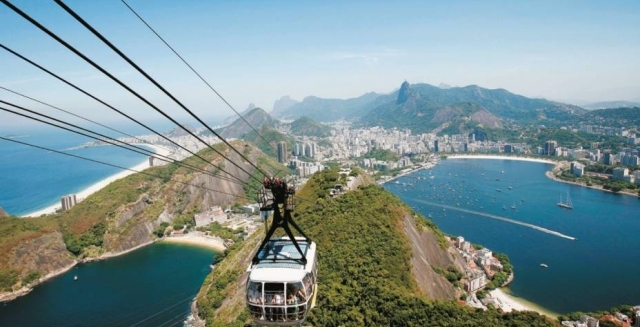 After riding to the top you can enjoy the fabulous first views of Rio from above. After descending and returning to your hotel, the late afternoon and evening are free. Day 2 : Christ on a Bike! After breakfast, you begin a morning cycling with the drive up to Vista Dona Marta for your first view of 'Cristo'. 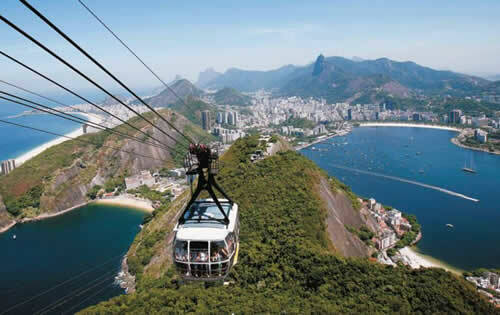 From here you pedal through the cool air of the Tijuca Forest, which covers the granite mountains around which Rio is built. A steep climb takes you to Corcovado and the iconic statue of Christ the Redeemer overlooks Rio. The 360˚ views of Guanabara Bay, Sugar Loaf, the Rodrigo de Freitas Lagoon and the beaches ringing the city are unbeatable. Other possible sights include monkeys, sloth and toucans. You continue up the Paineiras road and eventually down the spectacular curves of the Vista Chinesa route, to the lagoon and finally your hotel. Another cycling option with less mountains involves the long pedal along the Rio coastline westwards. 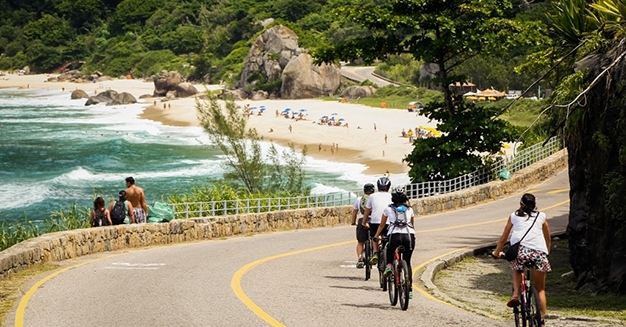 The new cycle route allows a mostly flat route from Ipanema around the rocks above the ocean to Sao Conrado, in the shadow of the flat-topped Pedra da Gavea. Another new cycle path then continues through tunnels and viaducts to Barra da Tijuca. The longest beach in Rio has 15km of cycle lanes to Recreio, with possible sightings of capybara and caiman along the way. A couple of short hills take you to the wild beaches of Prainha and Grumari, where you can have lunch in an open-air restaurant over the waves before the return journey! 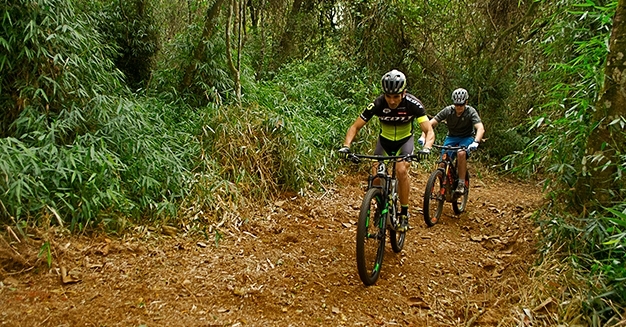 A drive up into the Tijuca Forest National Park begins a day of riding the park roads and tracks, and also the recently opened mountain-bike single tracks. The Cascatinha Waterfall marks the start of the ascent on the forest road, with the wide trail up and over to the Excelsior viewpoint having a panorama over the north of Rio and the Maracana Stadium. A single track descent cuts off from the trail for some rock-n-roots fun back to the lower part of the trail. Another ride up the park road takes up to the start of the trail to Tijuca Peak, the highest mountain in the forest, with the possibility to hike there too. Then it is downhill, with waterfalls and another single track to Açude, the end of the ride! The Pedra Branca Municipal Park has some great riding on some of the old trails over the saddles between peaks. An hour's drive along the coast from the main beaches takes you to Vargem Grande, the start of the Estrada do Morgado, a packhorse trail up through thick Atlantic Rainforest. The descent to Ilha da Guaratiba has a single-track cut-off before you hit the asphalt for a long flat ride to Barra da Guaratiba. A ridiculously steep climb is necessary through the houses to the trail that takes you to Telegrafo, with stunning views on either side of the peak. A single track along the ridge and a steep descent finish the ride in Grumari before you return to the city. Day 6 : The End of the Mountain Biking…? With so many mountains within a few hours' drive of Rio de Janeiro, your mountain biking need not be restricted to the city. Great trails in the Serra dos Orgaos, Tres Picos, Itatiaia and Serra da Bocaina parks can be combined with Rio rides. More wide trails and single tracks, with rainforest, waterfalls, stunning views back down to the city and the sea, with day rides and multi-day routes are possible. You can also travel further afield to ride around Chapada Diamantina or Chapada dos Veadeiros, two interior national parks with excellent multi-day routes. However long you choose to visit Brazil, we can fill all your days with fantastic mountain biking!